My eldest daughter is a student at Sheffield University. Like most students, she relies on us for a bit of help from time to time, and this includes me buying her larger items such as a winter coat and boots. Yesterday we met up at Meadowhall (near Sheffield) for a coat and boots shopping expedition. Meadowhall is the biggest mall locally to us with 1.5 million square feet of retail space. I’ve visited 3 times in the last ten years: since I’m trying to live a frugal life, recreational retail therapy doesn’t sit comfortably with me. Yet again I found the whole experience bewildering. There appears to be a requirement to dress up to go shopping, including perfect hair and makeup for women. People were walking laden with carrier bags, many from up-market labels, there were long queues for the changing rooms and even longer queues for for the tills. I didn’t see much evidence yesterday of the ‘age of austerity’. Perhaps people are living for today and ignoring this week’s pleas to pay down their debts. I do wonder where it all might end. What is even more interesting is what would happen if we did all stop shopping? Time limit the expedition – we limited ourselves to 4 hours which meant we were focused in our efforts and were not tempted to drift into other stores and buy unplanned purchases. It was wonderful to see my daughter, and I’m glad she has a warm coat, but I think a trip like this once a year is more than enough for me. I decided to try making sloe gin for the first time this year. I came across a thicket of blackthorn bushes on a walk a couple of weeks ago. I debated about whether to wait until after the first frosts, or to pick some and put them in the freezer. In the end the freezer won out – we’ve had some unseasonably warm weather for late September and early October and I wanted to have some sloe gin to drink at Christmas. One of my friends told me to pick more sloes than I thought I would need – because they are very small fruits, it’s easy to think you have picked enough when you haven’t. I went up Frugal Hill to the thicket one day after work and picked about a third of a carrier bag full. When I got home and weighed them, I found I had 3lb of sloes! I decided that I would make two batches of sloe gin and gave the spare 1lb to my friend. Two batches went on last weekend. I just bought some 1.5 litre Kilner jars because they are wide necked and would be easy to put the fruit in. 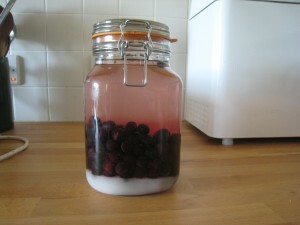 I used 1 litre of supermarket standard gin to 450g sloes and 225g sugar. I couldn’t bring myself to spend £16 on a bottle of premium gin but this year is an experiment, so see what will work. The second batch used the same amount of sloes, but 700cl cheap basic gin, and 100g sugar. 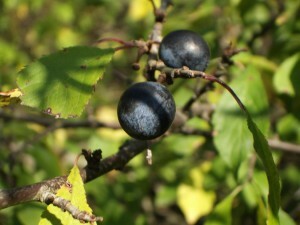 There seems to be a lot of folklore out there about how sloe gin varies according to the year, the tree, the type of gin, so it will be interesting to see how these two types of gin turn out later in the year,. I’ll let you know how it turns out nearer Christmas.